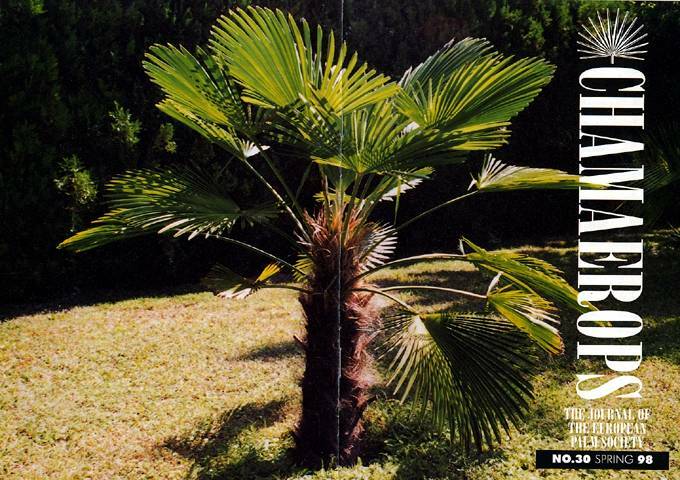 Record Breaker: Robert Lackner's amazing Trachycarpus wagnerianus, which grew from a completely defoliated stump to a hndsome palm with no less than 14 new leaves in a single season. Editorial Spring Edition, issue 30. A self-confessed Yuccaphile shares his passion for these architectural but unfriendly plants. Positively quivering with excitement, Howard writes of the pleasure and relief of finding he is 'not alone'. Another visit to Austrian member Robert Lackner's garden, full of practical information, and first hand knowledge. Vanuatu in the South Pacific is home to a beautiful but endangered palm. Cathy Clarkin describes the islanders' efforts to save it from extinction. Join Richard for a wander around Kew's second most famous glasshouse. Another thought provoking and practical article from Don, this time covering fungus and fencing!